(AP Photo/Carolyn Kaster) In this Nov. 16, 2016, file photo, Federalist Society Executive Vice President Leonard Leo speaks to media at Trump Tower in New York. The man credited with sending conservative jurists to the U.S. Supreme Court and other federal courts paid tribute Thursday to former Sen. Orrin Hatch and the rise of conservative judges. Leonard Leo, executive vice president of The Federalist Society, said he couldn’t imagine a “successful conservative legal movement” without Hatch. 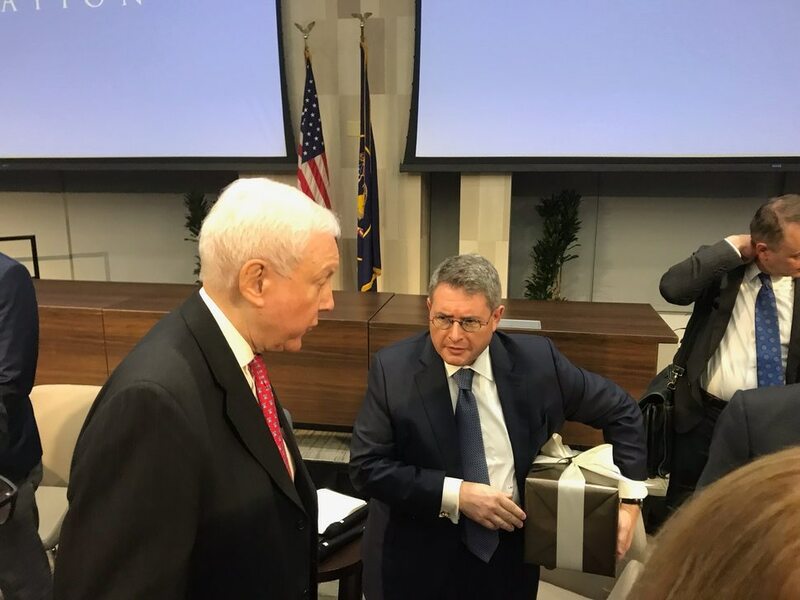 Hatch and Leo were among the speakers Thursday at a symposium hosted by the new Hatch Foundation at the University of Utah. The symposium was titled “Protecting Our Religious Liberty.” Leo was the keynote speaker. (Photo by Nate Carlisle | The Salt Lake Tribune) Former Sen. Orrin Hatch, left, speaks with Leonard Leo, executive vice president of The Federalist Society, at a symposium on religious freedom April 11, 2019, at the University of Utah. The Federalist Society believes in interpreting the Constitution as the Founding Fathers wrote it and that judges should rule to constrain government actions that infringe upon liberty. The society is best known for making recommendations that President Donald Trump has relied on as he selected two Supreme Court nominees as well as a number of selections for lower courts. Leo’s keynote address focused on the need for the courts to stop administrative action that infringes on religion. He pointed to Little Sisters of the Poor, a Roman Catholic religious order that runs homes for the elderly and was not automatically exempt from the requirements to provide contraception in employer health plans under the terms of the Affordable Care Act. The Little Sisters went to court to ensure an exemption from the requirement. Leo said the Trump administration will do nothing more important than appoint judges who will adhere to the fixed meaning of the Constitution. During a panel discussion, religious leaders from Utah described a supportive environment. Neale Neelameggham, of the Sri Ganesha Hindu Temple in South Jordan, recalled that when fundraising for the temple began in 1995, he reached out to other faiths for advice and support. Neighbors from The Church of Jesus Christ of Latter-day Saints suggested where to buy land. Area Muslims gave permitting advice and donated legal work so the temple could acquire the necessary rights of way. Misunderstandings and lack of perspective exist in Utah, too. Avais Ahmed, with the Utah Muslim Civic League, recalled attending Davis High School, where he said he was the only Muslim out of a class of about 1,000. Many of his Latter-day Saint friends thought they were a religious majority in the world, he said, and didn’t know anything about Islam. Ahmed encouraged Utah’s religious leaders to go into their communities and meet people who are different. “We, as leaders of our various communities, we can go out and break this us-versus-them lens." Gehrke: Spoiler alert! Here’s what is (or more likely is not) in the redacted version of the Mueller report. Aaron Blake: Barr did just what his critics feared he would do. Again. Red All Over: Ute running back Armand Shyne moves to Texas Tech. And is MyKayla Skinner really the ‘most hated’ gymnast?